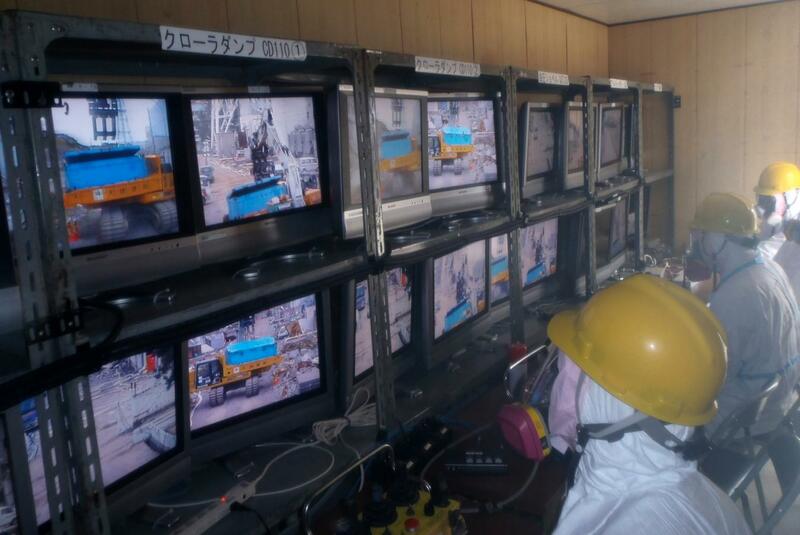 Photos taken by a T-Hawk drone on April 15, 2011, released by TEPCO. For the rest of the photo, go here. #Fukushima I Nuke Plant: Asking the Obvious after 1 Month - "Did Reactor 4 Also Have a Hydrogen Explosion?" Duh. But that's what Yomiuri Shinbun wonders aloud in its article (in Japanese, see the bottom of this post; 1:34AM JST 4/17/2011). And why does this newspaper wonder NOW? Because, apparently, TEPCO released the side-view picture of the Reactor 4 building. After having seen the aerial photos and videos of the Reactor 4 building with the roof and side panels blown off and the top floor (the 5th floor) in total mess and chaos, Yomiuri is claiming it didn't occurred to them until now: Oh, it may have been a hydrogen explosion, perhaps? Anyone but the Japanese had probably guessed long time ago that it was a hydrogen explosion, and in the case of the Reactor 4, hydrogen could only come from the Spent Fuel Pool (there was no fuel in the Reactor Pressure Vessel). -At approximately 6:00 am on March 15th, we confirmed the explosive sound and the sustained damage around the 5th floor rooftop area of the Nuclear Reactor Building. -At this moment, we do not consider any reactor coolant leakage inside the reactor happened. - At approximately 6:00AM on March 15th, there was a loud noise, and we confirmed a damage near the rooftop of the Reactor Building 5th floor. It is the same wording as the press release on March 15 after this "loud noise" was heard. Now, let's see what the Japanese MSMs were saying about this "loud noise" on March 15. They did report it, and some, including Yomiuri, even quoted experts saying it could be a hydrogen explosion from the exposed fuel rods in the Spent Fuel Pool. But then they very quickly moved on, and instead of further pursuing this hydrogen explosion aspect, they latched onto the fire that broke out later that day and the next day, and reported extensively about "two holes on the northwest side of the building". They also latched on quickly to the Self Defense Force chief's comment that there was water in the Reactor 4 Spent Fuel Pool - therefore, no fuel rods were exposed, and so no hydrogen explosion was possible. So, after a month, it is news (again) to a Yomiuri writer/reporter that there may have been a hydrogen explosion. The media is just as bad as the government, who "just didn't feel like announcing" the breached Containment Vessel and the core melt down in the Reactor 1 on April 12.
even higher than the one in the Taro District of Miyako City, which was 37.9 meters (124 feet) as measured by Tokyo University's Earthquake Research Institute. The tsumani run-up after the March 11 earthquake was 38.9 meters (127.6 feet) high on Omoe Peninsula in Miyako City, Iwate Prefecture, the survey by Professor Akio Okayasu of Tokyo University of Maritime Science and Technology revealed. The survey found that trees were felled by the tsunami on the side of the mountain near Aneyoshi Fishing Port on Omoe Peninsula, 400 meters from the shore. The tsunami run-up of 38.9 meters exceeded the 1896 record of Meiji Sanriku Earthquake. The run-up after the Meiji Sanriku Earthquake was 38.4 meters in the Ryori District of Oofunato City, also in Iwaki Prefecture. In the March 11 earthquake (Higashi Nihon Earthquake), Koborinai fishing port in the Taro District of Miyako City registered 37.9 meters (124 feet) run-up. Prime Minister's Assistant Hosono live on BS Asahi. He said from March 11 to March 22 hardly any of the [radiation] monitoring posts were working, and they were using data from remote observation points to guess the radiation level at the plant. In other words, the government and TEPCO were insisting on safety without any solid data. "BS" stands for "Broadcasting Satellite", although I wouldn't blame you for thinking about something else. So, I ask again: who's been spreading baseless "rumors", or 風評 (wind rumors)? Prime Minister Kan is considering naming Mr. Goshi Hosono as Minister in charge of dealing with the Fukushima I Nuke Plant accident. Preface: I am not against all nuclear power, solely the unsafe type we have today. The harmful affect of radiation on fetuses has been known for decades. In recent years controversy has arisen over the particular vulnerability of infants in utero and small children to the ill-effects of radiation. Exposure of the fetus to radiation during all stages of pregnancy increases the chances of developing leukemia and childhood cancers. Because their cells are dividing so rapidly, and because there are relatively so few of them involved in the vital functions of the body in the early stages, embryos are most vulnerable to radiation in the first trimester--particularly in the first two weeks after conception. This period carries the highest risk of radiation-induced abortion and adverse changes in organ development. During this stage of development the tiny fetus can be fifteen times more sensitive to radiation-induced cancer than in its last trimester of development, and up to a thousand or more times more sensitive than an adult. In general it is believed that fetuses in the very early stages of development are most vulnerable to penetrating radiation such as X rays and gamma rays. In all stages, they are vulnerable to emitting isotopes ingested by the mother. For example, if a pregnant mother inhales or ingests radioiodine, it can be carried through the placenta to the fetus, where it can lodge in the fetal thyroid and where its gamma and beta emissions can cause serious damage to the developing organ. Once the fetal thyroid is damaged, changes in the hormonal balance of the body may result in serious--possibly fatal--consequences for the development of the child through pregnancy, early childhood, and beyond. Such effects include underweight and premature birth, poorly developed lungs causing an inability to breathe upon delivery, mental retardation, and general ill-health. Other emitters can lodge in other fetal organs. For example, yttrium-90, a decay product of strontium 90, can gravitate toward the pituitary gland. Overall, fetal irradiation during the second and third trimester has been linked to microcephaly (small head size), stunted growth and mental retardation, central nervous system defects, and behavioral changes. Exposure of the fetus to radiation during all stages of pregnancy increases the chances of developing leukemia and childhood cancers. Young children also undergo more rapid cell division than adults, as do children in puberty. This rapid growth makes them very susceptible to radiation damage. Also at high risk are the elderly and chronically ill. These groups have weakened immune systems because of less active red bone marrow. Healthy immune systems can often isolate and remove damaged cells before malignancies develop. Older people generally have less vigorous immune systems; they have also generally experienced more radiation from both natural and human-made sources than young people, and thus may be more susceptible to additional exposure. Cancers shown to be initiated by radiation include leukemia, and cancers of the pancreas, lung, large intestine, thyroid, liver, and breast. Life-shortening anemia and other blood abnormalities, benign tumors, cataracts, and lowered fertility are other random effects attributed to radiation exposure. An entire field of science called "epigenetics", which studies changes in phenotype (appearance) or gene expression caused by mechanisms other than changes in the underlying DNA sequence. Epigeneticists say that genetic changes can be caused by interaction with the environment may last for multiple generations. The official refrain, boldly repeated, is, "Not to worry, perfectly harmless, no health threat," even though the six Fukushima reactors contain thousands of times more radioactivity than the bomb dropped over Hiroshima. Some of our best scientists of the previous century would be rolling over in their graves. In the 1940s, many of the world's premier nuclear scientists saw mounting evidence that there was no safe level of exposure to nuclear radiation. This led Robert Oppenheimer, the father of the atom bomb, to oppose development of the hydrogen bomb. In the 1950s, Linus Pauling, the only two-time winner of the Nobel Prize, began warning the public about exposure to all radiation. His opinion, ultimately shared by thousands of scientists worldwide, led President Kennedy to sign the nuclear test-ban treaty. In the 1960s, Drs. John Gofman, Arthur Tamplin, Alice Stewart, Thomas Mancuso and Karl Morgan, all researchers for the Atomic Energy Commission (AEC) or the Department of Energy (DOE), independently came to the conclusion that exposure to nuclear radiation was not safe at any level. The government terminated their services for coming up with what Gofman has called the "wrong answer" - that is, the opposite of what the AEC wanted to hear. The top Russian nuclear physicist in the 1960s, Andrei Sakharov, also a Nobel Prize winner, and Vladimir Chernousenko, whom the Soviet Union placed in charge of the Chernobyl cleanup, are among other international experts who drew similar conclusions. To put lipstick on the pig of radioactive fallout, we hear from nuclear cheerleaders that common activities like watching TV and airline travel also expose us to radiation. True enough, although they never mention that airline pilots and flight attendants do have higher rates of breast and skin cancer. But equating those very different types of radiation is like equating the damage of being hit with ping pong balls (photons) with being hit by bullets (beta particles). Your TV doesn't shoot bullets at you. Even if your TV was only shooting a few bullets per show, you probably wouldn't watch much TV. Furthermore, the damage done by these radioactive "bullets" can vary tremendously depending on which organs are hit. To carry the analogy one step further: spraying a few bullets into a large crowd can hardly be considered safe for everyone in the crowd, even if the ratio of bullets per person is very low. Bioaccumulation causes an increasing concentration of many contaminates as one moves up the food chain. That's why beef is much higher in dioxins than cattle feed, tuna fish have much higher mercury than the water they swim in and fetal blood has higher mercury levels than maternal blood. Radioactive iodine, cesium and strontium, all beta emitters, become concentrated in the food chain because of bioaccumulation. At the top of the food chain, of course, are humans, including fetuses and human breastmilk. In 1963, one week after an atmospheric nuclear bomb test in Russia, our scientists demonstrated the power of bioaccumulation when they detected radioactive iodine in the thyroids of mammals in North America, even though, with 1963 methods, they could not detect smaller amounts in the air or on vegetation. Bioaccumulation is one reason why it is dishonest to equate the danger to humans living 5,000 miles away from Japan with the minute concentrations measured in our air. If we tried, we would now likely be able to measure radioactive iodine, cesium, and strontium bioaccumulating in human embryos in this country. Pregnant mothers, are you okay with that? Hermann Muller, another Nobel Prize winner, is one of many scientists who would not have been okay with that. In a 1964 study, "Radiation and Heredity" , Mueller clearly spelled out the genetic damage of ionizing radiation on humans. He predicted the gradual reduction of the survival of the human species as exposure to ionizing radiation steadily increased. Indeed, sperm counts, sperm viability and fertility rates worldwide have been dropping for decades. These scientists and their warnings have never been refuted, but they are still widely ignored. Moreover, radiation standards are up to a 1,000 times higher than is safe for human health. And Forbes' blogger Jeff McMahon and Truthout writer Mike Ludwig both note that FDA radiation standards for milk and other foods are 200 times higher than EPA standards for drinking water, and are based more on commercial than safety concerns. And even with unreasonably lax standards, radiation exceeding government safety levels has been found in drinking water and milk throughout the United States. See this and this. CNN: "Arrogantly Complaining" About TSA Security May Land You on "Love Pat"
That's how the government trains people to be just "right". And remember, this added so-called "security" at the nation's airports (and bus stations and railroad stations) came on Prez Obama's order after the suspicious printer ink cartridge was allegedly shipped from Yemen and addressed to Chicago-area synagogues. Do you see a connection? I don't. ....But a civil liberties organization said the list should not include behavior relating to the expression of opinions, even arrogant expressions of opinion. What the hell does "arrogant" contempt mean? Arrogant to whom? TSA workers? When they are the ones who are arrogant and contemptible toward us? I'm sure you have seen this disgusting video of a black female TSA employee patting down a blond 6-year-old girl, putting her hands inside the girl's pants. And the country rolls over. An accepted part of being in the land of the free. The man was attending the seminar held in Yokohama, in Kanagawa Prefecture to learn how to measure radioactive materials. Kanagawa Prefectural Police arrested Keinosuke Ikawa (32 years old), who works as an engineer in the fishery section of the Aomori Prefectural government for allegedly inserting the camera from under the skirt of a female high school student. According to the Police, Mr. Ikawa was attending the seminar on how to measure radioactive materials in Yokohama. The seminar was attended by the employees at local and municipal governments in Japan. Mr. Ikawa allegedly inserted his small video camera from under the skirt of a female high school student (17 years old) from behind, on an escalator going up in the Yokohama Station in Nishi-ku in Yokohama City around 5:30PM on April 15. The railroad police on patrol caught him in the alleged act, according to the Police. Ikawa says he videoed. He has been in Yokohama since April 14. And that's only counting Iodine-131, Cesium-134 and Cesium-137. water sealing) in the building could be done. dispersion of radioactive substances and have been notifying the result. comparison with the trend one week before the discharge. radiation discharged was approx 1.5 x 10^11 Bq. wastewater to the sea if they eat adjacent fish and seaweeds every day. I suppose TEPCO is only talking about the environmental radiation level, and hasn't heard about "bioconcentration" or "bioaccumulation" (or has chosen to ignore, take your pick). discharging radioactive water even the nature was an emergency escape. (Some interesting translation here by TEPCO...) Never mind that TEPCO has irradiated people, plant, animals, fish, all living organisms, which should go beyond concern and inconvenience. Remember the post on Wednesday (4/13) about the high water temperature (90 degrees Celsius) of the Spent Fuel Pool in Reactor 4 and TEPCO's (and the government's) comment that the damage to the fuel rods there are only partial and everything is dandy? Workers were firing water into the pond from a distance in an effort to prevent the fuel from overheating and releasing radioactive contaminants, but fluid collecting in an adjacent flood control container triggered an incorrect warning that the pond had been filled. Personnel halted water transfers to the pool for a number of days in response to the warning, allowing heat and radiation levels to increase even though the fuel was thought to have remained submerged, Japanese Nuclear and Industrial Safety Agency Deputy Director General Hidehiko Nishiyama said. Water spraying began again on Wednesday. This bit of information is supposedly from AP, but I haven't been able to find the original AP article, and there was no link to the AP article at Global Security Newswire. I'll go find the video of the press conference given by Nishiyama of NISA. The Reactor 2's Reactor Pressure Vessel (RPV)'s temperature at the bottom was -116.3 degrees Celsius on April 14, according to Nuclear and Industrial Safety Agency of METI. That same temperature was 183 degrees Celsius on April 13. Also, the temperature of the Reactor 2's Spent Fuel Pool on April 14 was 71 degrees Celsius; the same temperature on April 13 was 46 degrees Celsius. The temperature of the Spent Fuel Pool seem to be oscillating between 45, 46 degrees and 70, 71 degrees. As the world burns, with radiation, with gun-fire and missiles, with huge sovereign debt or with higher and higher inflation, the California Senate passes a legislation that would require public schools to teach history of gays, lesbians, bisexuals and transgender people. SACRAMENTO, Calif. – Gays, lesbians, bisexuals and transgender people would be added to the lengthy list of social and ethnic groups that public schools must include in social studies lessons under a landmark bill passed Thursday by the California Senate. Supporters say the move is needed to counter anti-gay stereotypes and beliefs that make children in those groups vulnerable to bullying and suicide. Opponents counter that such instruction would further burden an already crowded curriculum and expose students to a subject that some parents find objectionable. The legislation, sponsored by Democratic Sen. Mark Leno of San Francisco, passed on a 23-14 party line vote. It also would add disabled people to the curriculum. The bill gives school districts flexibility in deciding what to include in the lessons and at what grades students would receive them. Appealing to colleagues for support, Leno said gay children still struggle routinely with verbal and physical abuse at school, even though society is more accepting than when he was a gay youth in the 1960s. "We are second-class citizens and children are listening," he said. "When they see their teachers don't step up to the plate when their classmate is being harassed literally to death, they are listening and they get the message that there is something wrong with those people." Republican Sen. Doug La Malfa of Butte opposed the bill. "I'm deeply troubled kids would have to contemplate at a very, very early age, when many of us are teaching abstinence ... what is sexuality," he said. California law already requires schools to cover the contributions to the state and nation of women, African Americans, Mexican Americans, entrepreneurs, Asian Americans, European Americans, American Indians and labor. After the high radioactive water was found in the turbine buildings at Fukushima I Nuke Plant, TEPCO has been testing ground water by testing the water from the Reactors' sub-drain pits. Radioactive materials measured in the sub-drain pit and which TEPCO is ALLOWED (by Nuclear and Industrial Safety Agency) TO DISCLOSE (iodine-131, cesium-134, -137) have risen materially in the Reactor 1 since April 6, particularly cesium. The result for the Reactor 2's sub-drain pit is also high. Expect an announcement a month from now that they also found a host of other radioactive materials (like plutonium and strontium). This map shows the locations of the sub-drain pits for each reactors (marked in yellow) and the location of the deep well (blue arrow) (the column in the far right in the tables). The radioactive materials in the Reactor 1 sub-drain pit may have come from the Reactor 2. But Wait, There Was More, to Prime Minister Kan's "Evacuation Zone Will Be Uninhabitable for 10, 20 Years"
The alleged remark by Japan's Prime Minister Kan that "the evacuation zone will be uninhabitable for a while; 10, maybe 20 years" wasn't complete. The remark, which the PM allegedly said in the private meeting with one of his "celebrity" advisors Kenichi Matsumoto of Reitaku University and which Professor Matsumoto himself later attributed to himself, not Prime Minister Kan, has been roundly criticized by the opposition as well as by some in the ruling coalition, not to mention the municipalities in the evacuation zone and in the newly designated "planned evacuation zone". "For such displaced people, we have to consider building "ecotowns" inland." Professor Matsumoto, whose undergraduate degree was in economics and graduate degree in Japanese literature, later retracted his initial statement that Prime Minister had said this; he know says PM Kan expressed agreement with HIS assessment that the evacuation zone would be uninhabitable for 10, 20 years and HIS recommendation that people from the zone should be relocated to inland "ecotowns". This PM and his advisor think people will follow them into inland "ecotowns", no doubt named like "Ecotown Iitate" or "Ecotown Namie", some of which will be built by shaving off the hills and mountains. "We must then begin preparations toward reconstruction. In fact, we will go beyond mere reconstruction, creating an even better Tohoku and even better Japan. We are moving forward with the creation of a reconstruction plan that has this big dream at its core. I have received many opinions over the telephone from the mayors of each city, town and village in the disaster-stricken area. These opinions will be incorporated into the plan; for instance, in some areas we will level parts of mountains in order to create plateaus for people to live on. Those residing in the area will then commute to the shoreline if they work in ports or the fisheries industry. We will create eco-towns, places which use biomass and plant-based fuel to provide natural heating. We will outfit cities with infrastructure to support the elderly. We aim to create new kinds of towns that will become models for the rest of the world." For him, that's "an even better Tohoku". Tell that to the 102-year-old man who didn't want to leave his home in Iitate-mura. For the Japanese government, the earthquake/tsunami of March 11 is nothing but another grand opportunity of dole out more pork to the construction industry. Sparkling new cities on top of the hills and mountains built by the big general contractors, whether people want to live there or not. And people who say they are incensed by Kan's (or Matsumoto's) remark about the evacuation zone to remain uninhabitable for 10, 20 years are not saying anything (except for many bloggers) about his other idea of shaving hills and mountains and building "ecotowns" for sustainable living. Either the idea is too stupid even to get angry at, or they are waiting to hear more about this new opportunity. Big constructions provide jobs and other goodies like joint venture opportunities and palm-greasing. Dig the ditch, bury the ditch. A 102-year-old man killed himself on April 12 in Iitate-mura in Fukushima Prefecture, which has been designated by the national government as "planned evacuation zone". Mainichi Shinbun (Japanese article copied below; 1:01 AM JST 4/14/2011) reports that the man lived with his eldest son and the son's wife in the village, and they were discussing the evacuation. He was said to be distressed about having to leave his home. shows that the damage to the fuel rods in the Pool is only partial, if that, says TEPCO. In normal operation of the reactor, these numbers would be less than 1 becquerel. The numbers are low compared to the contaminated water in the turbine building in which these numbers are in several million becquerels, leading TEPCO to conclude that "part of the fuel rods may be damaged, but the majority of the rods in the Pool are intact." Fuel rods were all under water (2 meters under water). So is everything dandy at the Reactor 4? Mainichi Shinbun (in Japanese; 10:23AM JST 4/13/2011) may be saying "Not so fast." Why? Because the temperature of the Pool is high, and the radiation level above the Pool is high. The Spent Fuel Pool's temperature was found to be 90-degrees Celsius, higher than the temperature (84-degrees Celsius) when the hydrogen explosion happened on March 15. In addition, at 6 meters above the Pool, the radiation level was 84 milli-sievert/hr; during normal operation of the reactor, the radiation level there would be 0.0001 milli-sievert. The Mainichi article says all TEPCO can do is to replenish the water in the Pool as it evaporates from the heat, until the water (coolant) circulation system is somehow restored to remove the heat. And when will that be? According to TEPCO's president in the presser on April 13 that I watched, "all in good time" and he really doesn't know much of anything. Japan's Prime Minister Kan: "Evacuation Zone Will Be Uninhabitable"
Talking about the evacuation zone around the Fukushima I Nuclear Power Plant, Kan said "It will be uninhabitable for a while. For 10 years, maybe 20 years," Matsumoto disclosed to the press. So it's not safe after all? So who was the one spreading the baseless rumor, 風評, that was safe even within the zone? in about an hour and a half. I'll watch if I'm not extremely tired. TEPCO's president, Masataka Shimizu, had a press conference back in March 13, and today will be his second since the earthquake and tsunami wrecked Fukushima I Nuclear Power Plant. What I still don't understand, though, is the Japanese government's insistence that the Fukushima I Nuke Plant accident is basically a problem that TEPCO has to solve, while interfering with TEPCO's effort to solicit help early on from foreign experts. He concluded his speech by asking the citizens to "buy goods produced in the affected areas, use them, or eat them, and enjoy" so that Japan recovers. That seems highly irresponsible for the head of the state to say that, but his way out several years down the road will be the same as Rumsfeld and Rice when they supposedly discovered that there was no WMD in Iraq: "Who could have known?" Expect the TEPCO president to say the same: 15-meter tsunami, Magnitude 9.0 earthquake, who could have known? Something strange seems to be going on inside the Reactor Pressure Vessel of the Reactor 2 at Fukushima I Nuclear Power Plant. Temperatures of the Reactor Pressure Vessels are measured at two locations: at the water nozzles (that TEPCO calls "A"), and at the bottom of the Vessels (that TEPCO calls "B"). The Reactor 2's "B" temperature was not recorded since March 31, but it suddenly came back on April 12, and the temperature is high, almost as high as the "A" temperature of the Reactor 1 RPV. The details of a government plan have emerged which would make Tokyo Electric Power Company and the nation's other electric power companies pay for the damages sustained by individuals and businesses from the Fukushima I Nuclear Power Plant accident. However, there's a hitch. Beyond 5.65 trillion yen or US$66.7 billion, the national government would pick up the tab, 100%. In other words, the entire amount of compensation would be paid one way or another by the Japanese people, both through raised rates and raised tax, and probably through inflation (finally) as Bank of Japan goes into printing mode. The base plan for the compensation scheme for the victims of Tokyo Electric Power Company's Fukushima I Nuclear Power Plant accident was revealed on April 12. Modeled after the compensation scheme of the Three Mile Island accident, a "mutual aid" fund would be set up jointly by TEPCO and other electric power companies. Each electric power company would be required to pay 30 to 50 billion yen (US$354 to 590 million) per reactor. TEPCO would pay 2 to 3.8 trillion yen (US$23.6 to 44.9 billion), and the national government would pay 100% beyond the amount to be paid by the electric power companies. In order to establish the compensation scheme, the government is looking to pass a special legislation. The national government and TEPCO are about to enter into a negoation over the compensation scheme. According to the base plan, TEPCO would pay 100 to 200 billion yen (1.18 to 2.36 billion) per year from their profit for 15 years, in addition to 510 to 850 billion yen (US$6 to 10 billion) for the 17 reactors it owns. The other electric power companies own 37 reactors total, and they would be required to pay according to the number of the reactors each owns. 9 electric power companies' total [that excludes TEPCO] would be between 1.1 to 1.8 trillion yen (US$13 to 21 billion). Above 5.65 trillion yen or US$66.7 billion, the national government would pick up the tab. $66.7 billion is 1.3% of Japan's GDP, which is $5 trillion. Here's the announcement by the Ministry of (Re)Education and (Un)Science on strontium found "for the first time" since the Fukushima I Nuke Plant "Level 7" accident. It turns out the samples were taken on March 16, 17, and 19. It took them more than 3 weeks to test? Or did it take them more than 3 weeks to admit? In the table, the top three are the soil samples; the bottom four are weeds. Here we go. And it's safe, I'm sure. Ministry of Education and Science announced on April 12 that a minute amount of radioactive strontium has been found in the soils and weeds of 6 cities, towns and villages in Fukushima Prefecture including Iitate-mura, and Namie-machi. Strontium-90 tends to accumulate in the bones as its chemical structure is similar to that of calcium. However, according to the Ministry, the amount detected this time was very minute and there is no ill-effect on humans. This is the first time that strontium was detected since the Fukushima I Nuke Plant accident started. Iitate-mura had the highest level of strontium-90 at 32 becquerels per 1 kilogram of soil. Yomiuri says "it's the first time that strontium was detected". Hmmm. It may be more like it's the first time that the Ministry thought about testing it. Strontium-90 (Sr-90) is not easy to detect. You have to look for yttrium (Y) and deduce the amount of strontium, and it takes about a week to do the analysis and calculation. I'm checking the Ministry of Ed and Science site for the actual numbers and locations..
A Magnitude 6.3 earthquake hit Fukushima and Ibaragi at 2:09PM JST April 12, 2011. Epicenter was INLAND, west of Iwaki City (which is south of Fukushima I Nuke Plant). Japan Meteorological Agency's Seismic Intensity was 6- in Fukushima-Hamadori (region along the ocean), where Fukushima I Nuclear Power Plant is located. Workers have been evacuated from the Plant. 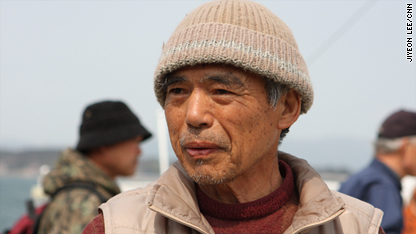 Susumu Sugawara and his boat "Sunflower" ("Himawari" in Japanese), an old passenger ferry, rode out the tsunami waves and survived to tell the story. Then the first wave came. Sugawara says he is used to seeing waves up to 5 meters high but this was four-times that size. "My feeling at this moment is indescribable," he says with glistening eyes. "I talked to my boat and said you've been with me 42 years. If we live or die, then we'll be together, then I pushed on full throttle." "Here was my boat and here was the wave," he says, holding one hand low and the other stretched high above his head. "I climbed the wave like a mountain. When I thought I had got to the top, the wave got even bigger." Hats off to the captain. in Miyagi Prefecture. The bus belongs to the couple (left, center) who ran Minami-Sanriku Sightseeing Bus Company for 24 years. They hope to get back in business, even though they lost almost all vehicles that they owned. Photo is from Asahi Shinbun (4/10/2011). During the presser by Nuclear and Industrial Safety Agency (NISA) yesterday (April 11 Japan Time), one reporter from the MSM (Asahi, in this case) asked a question that caught Mr. Nishiyama of NISA off guard: Is it safe to let the residents return while the nitrogen is being injected into the reactors at Fukushima I Nuke Plant? "So the operation to inject nitrogen gas into the Reactor 1's Containment Vessel is still on-going, and that operation is to prevent a potential hydrogen explosion. And you've said the similar operation is being planned for the Reactors 2 and 3. That seems to mean that the situation at the plant is still volatile and possibly dangerous. "But I hear the government is planning to allow the residents within the 20-kilometer radius from the plant to return home on a temporary basis. Is it safe to do, given the current situation of the plant?" "Ooops. (Why didn't that Chief Cabinet Secretary think of that?)" "The decision on the evacuation zone is being made by all the Ministries and Agencies involved, with close coordination with the Prime Minister's Office and Tokyo Electric, and all things are being taken into consideration." As a good reporter from the MSM, the reporter didn't press Mr. Nishiyama and insist on knowing whether the nitrogen injection and potential hydrogen explosion at the plant was taken into consideration in deciding whether to allow the residents to return home. Uh oh.. Nigrogen and radioactive steams escaping from the Containment Vessel (which they call "Primary Containment"; "Secondary Containment" being the building itself, which is already badly damaged in the case of the Reactor 1). TEPCO announced today that the pressure of the Containment Vessel of the Reactor 1 at Fukushima I Nuclear Power Plant has stopped rising above 1.95 atmospheric pressure; TEPCO has been injecting nitrogen in order to prevent a hydrogen explosion. TEPCO thinks that a significant amount of radioactive steam and nitrogen is escaping the Containment Vessel and into the surrounding area. TEPCO has been injecting 28 cubic meters of nitrogen per hour since early hours of April 7. The pressure inside the Containment Vessel rose gradually from 1.56 atmospheric pressure on April 7 to 1.9 atmospheric pressure on April 9, but the pressure stopped rising at 1.95 atmospheric pressure on April 10. About 1,000 cubic meters of steam and nitrogen may have been escaped, but there has been no significant change in radiation levels around the Plant. The plan was to inject 6,000 cubic meters of nitrogen into the Reactor 1's Containment Vessel over 6 days, and raise the pressure from 1.5 atmospheric pressure to 2.5 atmospheric pressure. TEPCO thinks "the containment vessel's seal is compromised, and significant amount [of steam and nitrogen] is escaping." TEPCO will continue to inject nitrogen while trying to figure out what to do in order to avoid a hydrogen explosion. The US's NRC didn't think the Containment Vessel of the Reactor 1 was broken, but that was March 26. Earlier today, I was watching the separate press conferences of Nuclear and Industrial Safety Agency and TEPCO (which they did it roughly at the same time). What was interesting was a "doom and gloom" among the Internet audience of these press conferences that were presented live by independent journalists (yes there are such people now in Japan). Many of them were saying (tweeting) that there was something amiss in both press conferences, as if some huge SHTF event was coming soon. Iitate Village disclosed on April 11 that the national government ordered the village to systematically evacuate the villagers in anticipation for the expansion of the evacuation zone. Iitate Village in Fukushima Prefecture has had high radiation levels ever since the TEPCO's Fukushima I Nuclear Plant accident. 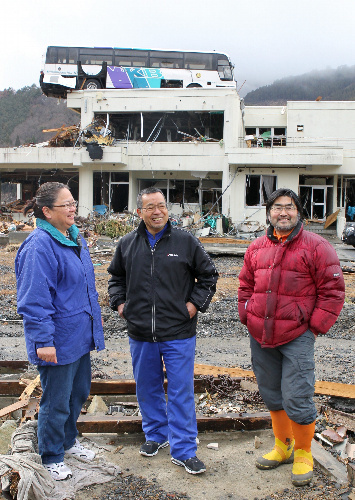 The village chief [actually he is the vice chief], Shinichi Monma said in the village council's special committee for disaster measures, "All villagers will be evacuated. The national government has told us to evacuate within a month." Iitate Village's population is about 6,500. Already, about 1,000 villagers have evacuated voluntarily (i.e. without government order). No information on how long the evacuation lasts, or where they are supposed to go. To the villagers, it may mean the end of their community that has lasted more than several hundred years if not a thousand or more. Cryptome.org has the paper prepared by the NRC Reactor Safety Team for their team currently in Japan. It gives the assessment of the plant's reactors and recommendations. New York Times wrote an article based on this document. Let me know if you see anything that hasn't been reported in the NYT article. I'm reading now. By the way, TEPCO ordered a flyby by an unmanned helicopter of the Reactors 1 through 4 on April 10. I'm waiting for that video to show up on Cryptome, hopefully soon. The "radius" approach, which doesn't make sense at all when you consider the radioactive materials being dispersed in the air, is set to be modified, though it will be continued to be used. The Kan Administration has decided on the new policy to issue orders for evacuation in the areas outside the 20-kilometer radius from the Fukushima I Nuke Plant which have high cumulative radiation. The new policy will be announced as early as today (April 11). Some areas between 20 to 30-kilometer radius ("stay indoors") and some areas outside the 30-kilometer radius are to join the evacuation zone. The areas that will be newly designated as "evacuation zone" are the areas whose cumulative radiation level is expected to exceed 20 milli-sieverts per year, and they will be called "planned evacuation zone". 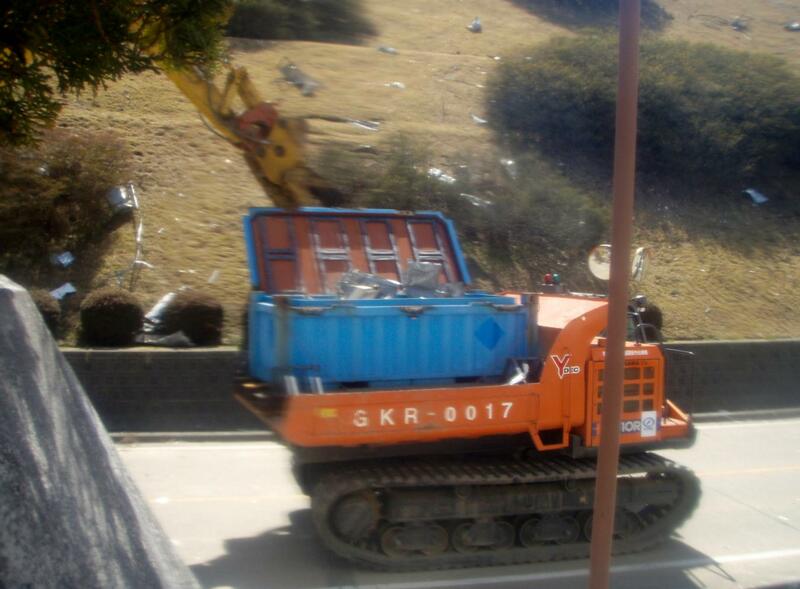 The residents will have about 1 weeks to prepare, and they will be evacuated by buses prepared by the government. The new "planned evacuation zone" will not form a concentric circle like the evacuation zone that has been in place, but will be like a mosaic. The current "evacuation zone" within the 20-kilometer radius will become the "warning zone" under the Basic Emergency Measures, and entering the zone will be prohibited, while allowing the residents to temporarily return home on certain conditions. Chief Cabinet Secretary Yukio Edano told the press on April 10 that the "warning zone" was "in the final stage of planning. [We will be able to tell you about it] in not too distant future." That "temporary return", they're talking about 1 or 2 hours for the residents to collect the absolute minimum from their homes. This is after the government sent out scholars and researchers in the cities and towns affected by the Fukushima I Nuke Plant accident to convince the residents not to worry about radiation and radioactive materials. The cumulative radiation of 20 milli-sievert was what the Nuclear Safety Commission (not the Agency) had been advising the government to adopt as one of the criteria in deciding whether to evacuate the residents. As I posted before, the radiation level in part of a town (Namie-machi) at about 30 kilometers northwest of the Fukushima I Nuke Plant is already at 11.63 milli-sieverts, cumulative over 13 days ending April 5. That number seems to measure only external exposure. In the meantime, the news on the MSM in Japan is scrubbed almost clean. Yomiuri's site right now has only one headlines at the top that is related to Fukushima I Nuclear Power Plant, that the TEPCO's president is visiting Fukushima to apologize. Asahi has a report on a family who lived next to Fukushima I Nuke Plant, but the rest of the news are about the local elections and Masters' golf. It's similar with other major papers. Fukushima I Nuke Plant accident is a minor nuisance, or is treated as such both by the government and the media. Never mind that TEPCO or Nuclear and Industrial Safety Agency doesn't seem to have a clue as to what to do and how to do it. If you don't report it, it doesn't exist. ""Oh what should I do?" What should you do? Grow up, you are adults!" "Use your brain, you are adults. Your life is on the line!" 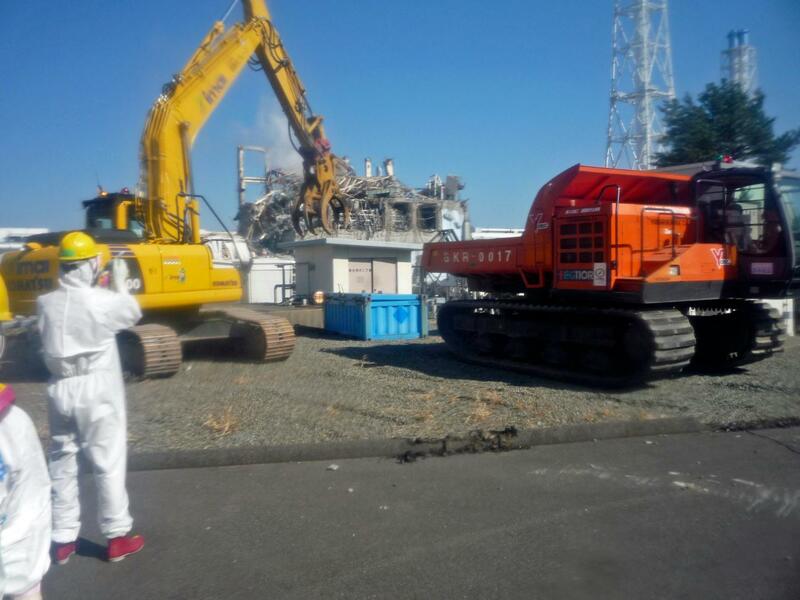 Ministry of Health, Labor and Welfare announced on April 10 that the radioactive materials were found in 3 samples out of 21 total from Fukushima Prefecture which exceeded the provisional limit. The 3 samples that exceeded the limit were harvested on April 8 in Date City, Shinchi-machi, and Iitate-mura. From shiitake from Iitate-mura, radioactive cesium was detected at 13,000 becquerels/kilogram which is 26 times the provisional safety limit; radioactive iodine was 12,000 becquerels/kilogram, which was 6 times the provisional safety limit. Shiitake from Date City had 1,460 becquerels/kilogram cesium [almost 3 times the limit], and Shiitake from Shinchi-machi had 550 becquerels/kilogram cesium [50 becquerels/kilo above the limit]. The provisional safety limit for radioactive cesium in foods (except water and dairy products) is 500 becquerels/kilogram. The provisional safety limit for radioactive iodine (except water and dairy products) is 2,000 becquerels/kilogram. Meanwhile, media campaigns using the local and national celebrities are on-going to appeal the safety of vegetables, fruits, milk, fish from Fukushima, Miyagi, Ibaragi, and other prefectures more affected by the radioactive contamination from the Fukushima I Nuke Plant. Yomiuri (4/10/2011) reports that the Ministry of Education (full name is ridiculously long, and it is "Ministry of Education, Culture, Sports, Science and Technology) is about to set the limit on radiation level in school yards in kindergartens and elementary schools in Fukushima Prefecture. 20 milli-sievert/year was the maximum permissible dose to radiation workers averaged over five years, with a maximum of 50 mSv in any one year (see wiki), until Fukushima I Nuke Plant accident happened. The Ministry of Education is about to set the standard for the amount of radiation when children engage in outdoor activities in kindergartens and schools, such as in the school yards. In Fukushima Prefecture, relatively high levels of radiation and radioactive materials have been detected in some schools, and the Ministry has decided it is necessary to set the standard soon for deciding whether to allow outdoor activities such as physical education. According to the Ministry and other sources, the new radiation standard will take into account the typical amount of time when the schoolyards are in use, and will be based on the allowed radiation amount of 20 milli-sievert (20,000 micro-sievert) per year for children. After receiving the advice from the Nuclear Safety Commission, the Ministry will show [among others] the radiation standard for the air to the Fukushima Prefectural government. One idea is to prohibit the use of school yards and conduct classes only indoors when the limit is exceeded.